REDWOOD CITY, Calif.—Tutor Perini Corporation (NYSE: TPC), a leading civil and building construction company, announced today that its California building subsidiary, Rudolph and Sletten, has been awarded the following projects collectively valued at approximately $490 million. To date since the time of the awards, the Company has booked approximately $182 million into backlog, and the remaining contract amounts are expected to be booked into backlog in phases as each project progresses. As part of a complete transformation of a prominent San Diego shopping center,Rudolph and Sletten was awarded the concrete package valued at $58 million. The mall-level shopping experience will be expanded west, above structured parking on a podium. The structural cast-in-place concrete parking structure includes 584,000 square-feet of slab-on-grade; another 500,000 square-feet of concrete over metal deck, shear walls, retaining walls and shotcrete walls; and 1,000,000 square-feet of elevated concrete decks and columns. Rudolph and Sletten’s self-performed concrete work includes all foundations, walls, slabs-on-grade and concrete over a metal deck. Work is currently underway and is expected to complete in late 2016. Rudolph and Sletten is scheduled to break ground on this 80,000-square-foot laboratory research and office building in the summer of 2016. The IGB will be a state-of-the-art laboratory designed to accommodate 300+ occupants with wet and dry laboratory space, office space for researchers and program managers, a computation center and warm and cold rooms for research. The project is pursuing LEED Gold certification. The IGB is intended to accommodate two existing Department of Energyresearch programs currently residing in off-site leased space: The Joint Genome Institute (JGI) in Walnut Creek, California, and the Systems Biology Knowledgebase (KBase) in Emeryville, California. Consolidating existing biosciences research in the IGB will increase resource efficiencies and scientific synergies for the JGI and KBase programs. Rudolph and Sletten has partnered with SmithGroupJJR on this design-build academic building scheduled to break ground in early summer of 2016 in Vacaville, California. The 33,310-sqaure-foot single-story Biotechnology & Science Building will have a biotechnology suite consisting of four laboratories with anterooms, prep spaces, clean rooms and a viewing gallery. 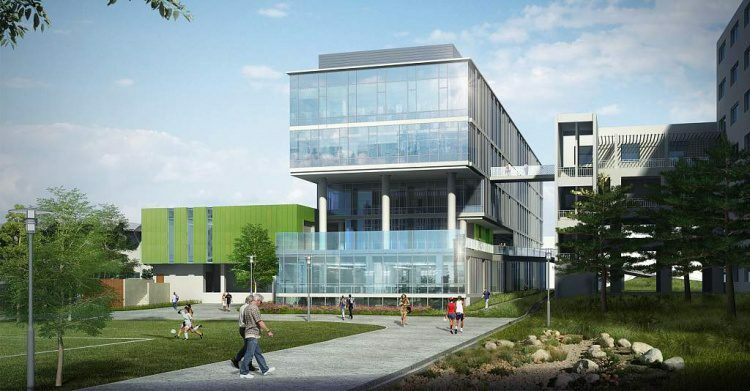 This suite will serve Solano Community College in their new Biotechnology Bachelor of Science degree program, and was conceived in conjunction with Solano biotech partner Genentech. Also included are two biology labs with a connecting prep space, an anatomy lab with dry and wet work areas and storage, a chemistry lab with storage and prep spaces, faculty offices and student interactive spaces. The new state-of-the-art building will tie into the existingVacaville Center Classroom building to promote interaction among the students.